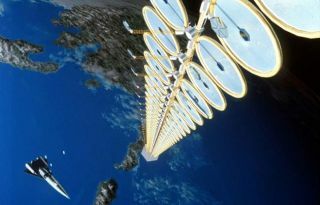 This solar power satellite design features sets of lightweight, inflatable fresnel reflectors to focus the Sun's energy on small arrays of high-efficiency photovoltaic cells. The U.S. Air Force has laid out a new vision for its energy science and technology needs over the next 15 years – a forecast that includes plans for space-based power stations and the prospective use of small nuclear reactors for new spacecraft. The report, entitled "Energy Horizons: United States Air Force Energy S&T Vision 2011-2026," focuses on core Air Force missions in space, air, cyberspace and infrastructure. A series of Air Force mission-focused workshops and summits were held to shape the new strategy. The report was released Feb. 9 and details how the Air Force plans to increase energy supply, reduce demand and change military culture to meet mission requirements. "Energy is a center of gravity in war and an assured energy advantage can enable victory," said Mark Maybury, chief scientist for the United States Air Force. He spearheaded the report. "While energy is already an essential enabler," Maybury said. "Global competition, environmental objectives and economic imperatives will only increase its importance." An artist's impression of what JAXA's Space Solar Power System might look like if it used laser transmission to beam solar power down to Earth. In the sweeping report a number of desirable high-tech advances are mentioned. For example, the Air Force is currently limited to 27 kilowatt (kW) arrays for satellite power. But more power is required for some future space missions, the report states, such as flights currently being eyed by the Air Force, national security organizations and NASA. "Employing larger and more efficient arrays will enable missions that require very high power, such as space-based radar or space-based laser missions," the report states. In the long term, the report says, increased solar cell efficiencies and revolutionary materials foreshadow the potential of 500 kW on-orbit power generation technologies, "which would be transformational for performing missions from space-based systems." Technicians work on nuclear generator attached to Transit 4A. In terms of nuclear power in space, several satellite systems have been energized by Radioisotope Thermoelectric Generators (RTG). This source provides consistent power, and at a much higher energy and power density than current technologies. Work on small modular nuclear reactors on Earth is highlighted in the Air Force report: "While the implementation of such a technology should be weighed heavily against potential catastrophic outcomes, many investments into small modular reactors can be leveraged for space-based systems. As these nuclear power plants decrease in size, their utility on board space-based assets increases." The report explains that the Air Force space systems portfolio should consider piloting small modular nuclear systems, a view previously recommended by the Air Force Scientific Advisory Board. The Air Force report also delves into the wireless transfer of power, a technology that continues to offer big promises despite the daunting challenges involved in making it a reality. While there are many challenges in "space-to-earth" power beaming, "space-to-space power beaming" could be transformational, the report stresses. An energy-beaming benefit for the military is powering sets of fractionated, distributed satellite systems, the report explains. Doing so would enable spacecraft to be smaller, more survivable, and more capable than current systems. In orbit, many spacecraft systems — sensors, communications equipment and on-board processing — can require intense amounts of power. Like all computing architectures, these systems are currently composed exclusively of silicon- based technology. However, decades of work has begun to change this paradigm, the report points out. Newer systems require less energy and offer a reduced thermal load in comparison to their silicon counterparts, the report adds. Advances in satellite propulsion are also spotlighted in the newly issued report. Today, the ability of space-based systems to alter their orbits is based on blasts of on-board fuel. The possibility of on-orbit refueling for these systems is now being studied. In the mid- and far-term, the report suggests, other propulsion technologies will provide exceptionally efficient propulsion. That will allow the fuel onboard orbiting systems to be utilized for longer periods of time. Hall and electric thrusters, for instance, promise extended utility of limited onboard propellants. Whatever the technology, new methods of generating power in space hold great promise for the Air Force's plans for new satellites and other space missions. The report's cover letter, signed by both Secretary of the Air Force Michael Donley and Air Force Chief of Staff Gen. Norton Schwartz, explains how effective energy management not only plays a key role in supporting national objectives, but is also essential to operational readiness. "Energy is essential to all Air Force missions," the letter states. "Improving energy efficiency, reducing demand and changing the culture is vital to mission success." Click here to read the entire Air Force report on space power systems.